Over the past twenty years I’ve traveled to Indonesia many times but my fascination with that country, its culture, its people, its cuisine and even its politics continues. For one, the country is comprised of thousands of islands and that is why there is immense diversity there. No matter how many times I visit Indonesia, I always find new things to look at, new things to eat and new places to explore. Although there is a lot of variety in the kinds of dishes prepared by Indonesians from different islands, being a country surrounded by water, seafood is always a common ingredient. Of course, since the quality of the seafood is so good, even the simplest of recipes brings forth the tastiest of dishes. 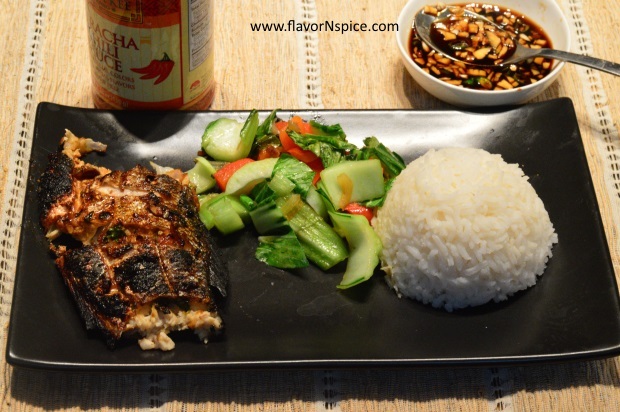 One of my all-time favorite dishes here is the grilled fish (Ikan Bakar). The Indonesian stuff the inside of a fish with a blend of aromatic ingredients (shallots, garlic and green chilies) and marinade the fish in a blend of sweet soy sauce (what is called Kecap Manis…which is basically soy sauce and molasses combined to make a thick syrupy sauce) and regular soy sauce. I added a bit of Sriracha Sauce to give my marinade a bit of extra kick. Also, I grilled it over charcoal and that gave the fish a crispy charred skin and that was absolutely outstanding. I served it with simple jasmine rice and stir-fried baby bak choy. It made for a delicious, healthy and simple to make meal! 1. 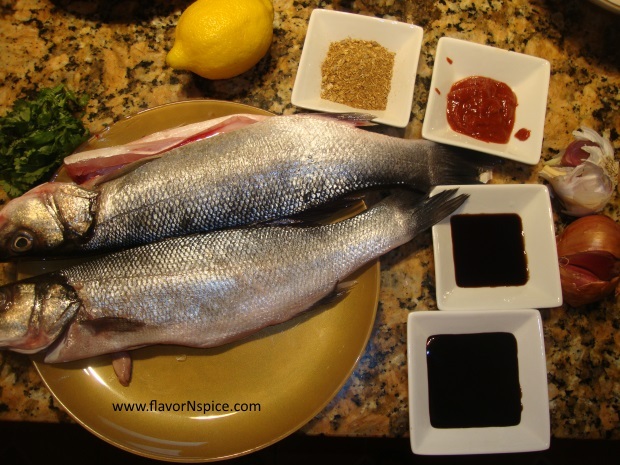 2 whole Bronzini (you can use red snapper or rock-fish or any kind of fish you like)…about 2-2.5 lbs. 12. One tablespoon Extra virgin olive oil. 13. A pinch of freshly ground black pepper. 1. 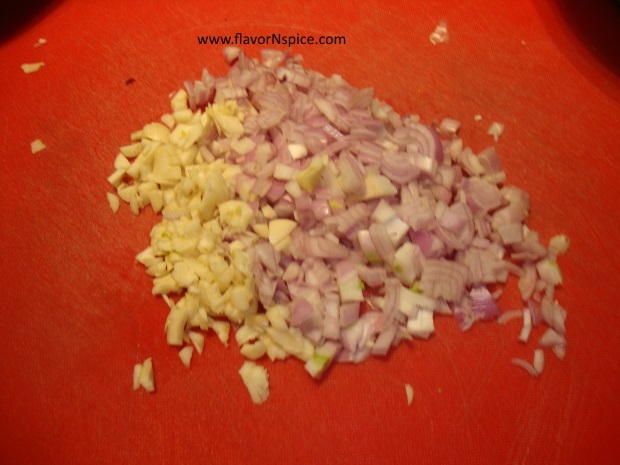 Peel and finely chop the shallot. 2. Peel and finely chop the garlic. 3. Zest one lemon and keep the zest in a bowl. You will need to use the juice of the lemon later. 4. Finely chop the cilantro and the green chili. 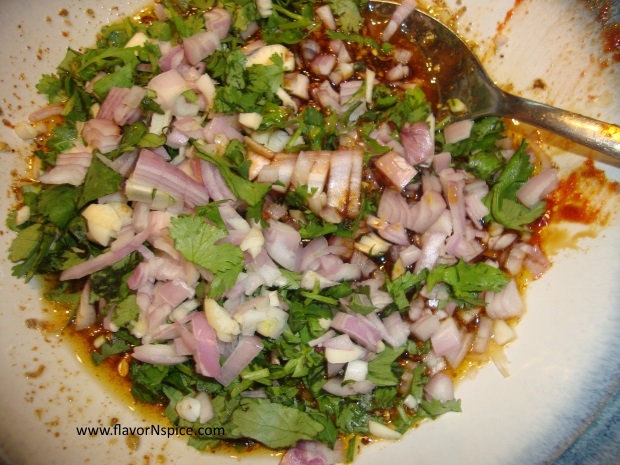 In a bowl mix all the following ingredients: the zest of the lemon, chopped shallots, garlic, cilantro and green chili. 5. 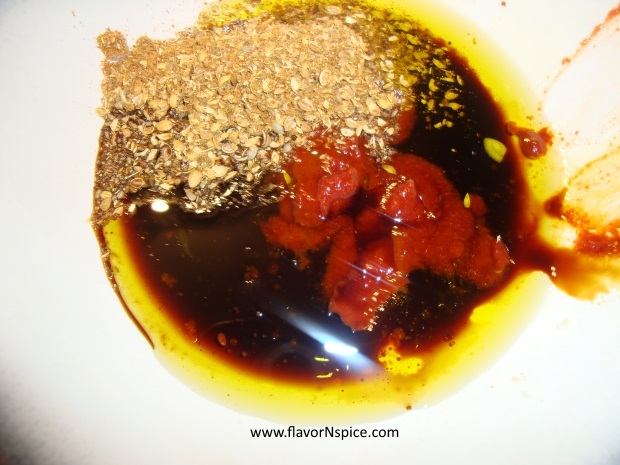 Combine the juice of half a lemon, onion powder, black pepper, coriander powder, olive oil, soy sauce, Kecap Manis, Sriracha and rice vinegar in another bowl to make the liquid sauce. 6. 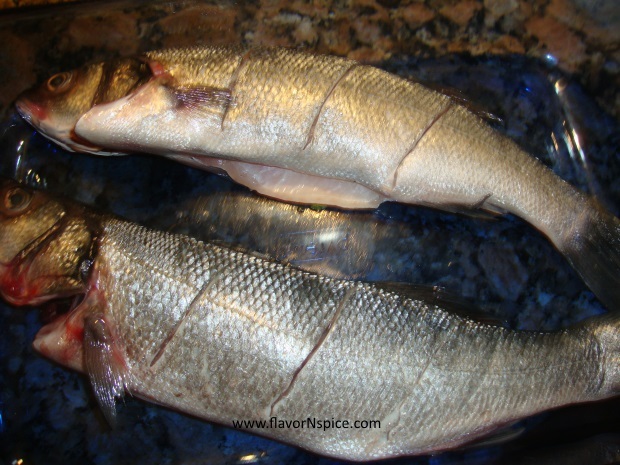 Cut slits into the flesh of the fish on either side. 7. 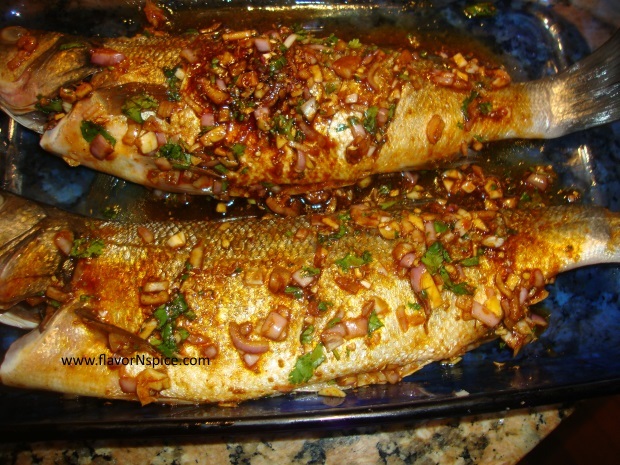 Stuff the inside of the fishes with the mixture of chopped shallots, chopped garlic, chopped cilantro and green chili. Also try to stuff this mixture into the slits that you made into flesh of each of the fish. 8. 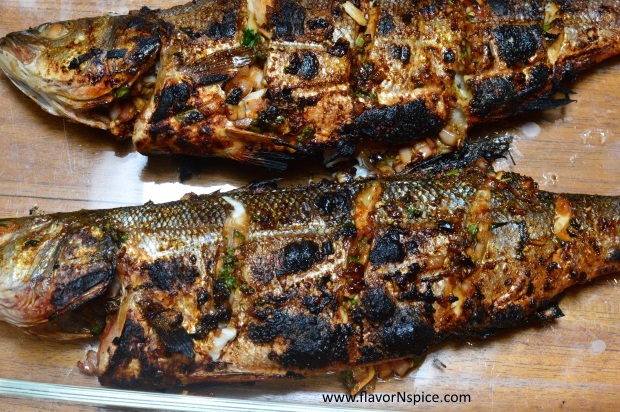 Pour the liquid sauce in the inside of the fish and also on top of the fish (both sides). 9. Heat up the grill (gas grill work too but for better results please use a charcoal grill). 10. 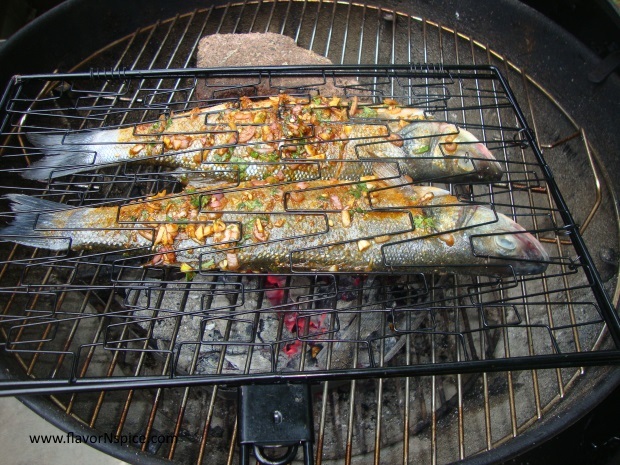 Grill the fish on both sides till the inside of the fish is looked and the skin is slightly charred. 11. 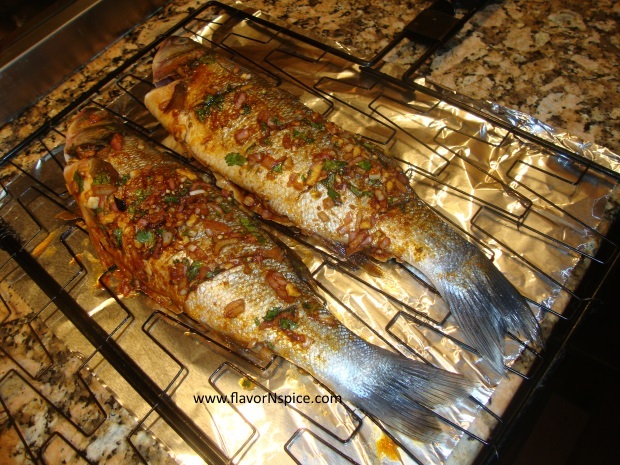 When the fish is cooked (usually takes about 5-7 minutes on each side but the time varies depending on the size of the fish), drizzle the juice of half a lemon over it. 12. 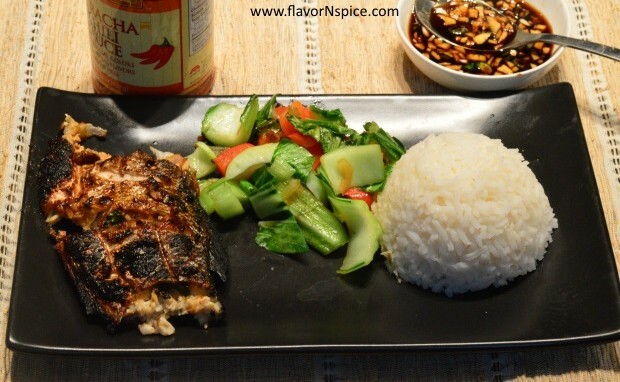 Serve the fish while it is still hot with boiled jasmine rice and stir-fried vegetables on the side. Some extra Sriracha and Kecap Manis on top is also nice.